One tough thing about being a writer is that sometimes the words just don't flow. Well, there's certainly no writer's block on the back of this year's Australian Open and particularly finals weekend. The matches couldn't have been more different. Newly crowned World No. 1 Victoria Azarenka subdued 2008 champ Maria Sharapova 6-3, 6-0; while defending champion Novak Djokovic found his way past 2009 champ Rafael Nadal in five lengthy, byzantine sets 5-7, 6-4, 6-2, 6-7 (5) 7-5. As disparate as the scorelines were, is as similar the compelling storylines were both coming into and going out of the first leg of tennis' fabled Grand Slam. Without further ado, here's how Blacklabel Tennis looks back on the 2012 Australian Open singles championships. If you think Victoria Azarenka had little reason to be nervous during the Australian Open ladies' final, well... think again. She was playing in her first major final; playing for the No. 1 ranking and playing against a multiple major champ and former No. 1 in Maria Sharapova. The fact that the bella Belarussian comprehensively dismissed Sharapova 6-3, 6-0 in this year's final was as much a testament to Azarenka's big, bruising game as it was to Sharapova's all but complete inability to control her groundstrokes in the final. The beauty of the Azarenka victory, besides the woman holding the trophy, is that unlike recent maiden major champions Francesca Schiavone, Na Li and Samantha Stosur, the Azarenka title feels in line with the natural order of things. Azarenka is a 22 year old who by all measures is headed into the prime of her career. The Australian Open was her 10th tour level title, following two wins at the Premier (think WTA Masters) event in Miami and a narrow loss to Petra Kvitova in the final of the WTA Tour Championships back in October. When they won their majors, it was only the then 29 year old Schiavone's fourth tour title; 29 year old Li's fifth; and just the third tour-level singles title for 28 year old Stosur. Azarenka's already won two titles in 2012. The Schiavone, Li and Stosur wins echo the kind of late-career, last gasp effort we saw and celebrated from Jana Novotna, when she avenged her Wimbledon hex in 1998 at age 29. That said even Novotna had the courtesy to legitimize herself with championship hardware from 21 other tournaments by the time she claimed Wimbledon. Like her 21 year old rival Kvitova, Azarenka has established herself as having the potential to be a significant champion of her era, maybe even a great. With Azarenka, like Kvitova, there's the potential that we're seeing the start of something big, as opposed to a random occurrence for a nice player. At the very least, Azarenka's already a No. 1 player with a major to her credit. For Maria Sharapova, well, it feels like she's been a big presence in the women's game forever and a day. At 24, she's actually just two years older than the still emerging Azarenka. We'll admit, we've given Sharapova some tough love before. One of our earliest posts back in 2010 called on the Siberian siren to get angry, re-think her coaching situation, get fitter than ever. In short, it read that something needed to change if Maria were ever again going to approach the heights she had reached as a fearless, injury-free youngster. In the year-and-a-half since that post (and to be clear that our ego is in check, in no way because of it) Sharapova brought on Thomas Hogstedt to replace Michael Joyce; shored up her defense and steadied the ground game that kept her in contention even before the recent resurrection of her serve. With the changes and more of the hard work that has long been her trademark, Sharapova's ranking has risen from No. 21 when we issued our challenge, to No. 3 in the world today on the back of finals at Wimbledon and the Australian Open in the last year. As an young player, Sharapova earned a reputation as the most mentally tough woman this side of Serena Williams. The young Sharapova rarely showed frustration on the court and had a never say die attitude, snatching more than a few comebacks with her iron will alone as her opponents suffocated under the pressure. Ironic given the fact that Sharapova never seemed comfortable as World No. 1. She's held sway in the rankings penthouse four times between 2005-2008, but her longest period at No. 1 was a seven week stint in 2007. She's only spent a total of 17 weeks at No. 1. As she's worked the last three years to come back from a debilitating shoulder injury, she has maintained a graceful, composed demeanor when she had every right in the world to throw a temper tantrum or twelve about the unfairness of it all. Even in the wake of her unceremonious drubbing at the hands of Azarenka, Sharapova was by turns gracious in her runner-up speech and philosophical with the press, "Obviously to get to the final is a good achievement, but to end up being the one that loses is always tough....I'm proud of the fact that I made it this far. It's been a few years since I've been, you know, in the finals of the Australian Open, It's a good start to the year, I guess, for me. I have a lot to look forward to this year." The men who eventually set the table for Breakfast At The Aussie were two already dyed-in-the-wool champions. Their pedigree didn't mean there weren't statements to be made though, by any means. Ten times Rafael Nadal has gnawed the trophy on the second Sunday at a major, but his two prior attempts ended the same way, with dispiriting losses to the man directly across the net, World No. 1 Novak Djokovic. Djokovic, for his part, captured three major titles last year and was tasked with proving that he was oh, so far from a fluke. In a tennis world seemingly divided between the Nadal and Roger Federer camps; Djokovic emerged in 2011 as a monster third-party candidate. Upending the world order we've known for so long last year, Djokovic's goal coming into this Australian Open was to truly remake the tennis world with himself at the top; Nadal's was to reassert himself as a champion on the biggest stages and to reverse the hoodoo jinx that Djokovic had on him with six consecutive wins in finals. At the start, it looked as if Nadal was hellbent on restoring on the old guard; sprinting to a 4-2 lead and then holding his ground after some shaky play for a 7-5 first set win once Djokovic began to find his range. From there, Djokovic captured the next two sets with increasing ease. 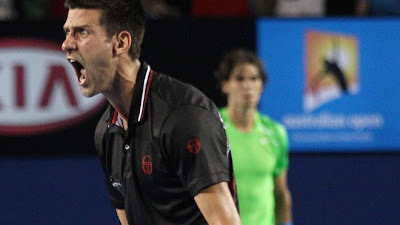 When the Serb edged ahead in the fourth set, he genuinely appeared ready to dismiss Nadal in four sets for the third major final in as many tries. 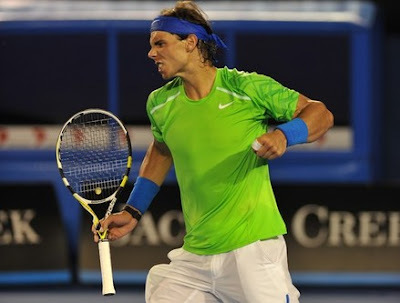 With the match seeming to be all but in the record books, Nadal turned the tables. Bringing his heaviest artillery to the fore, Nadal launched stinging serves and flamethrower forehands in an attempt to decide the outcome of the match (and turn the rivalry) in his favor. 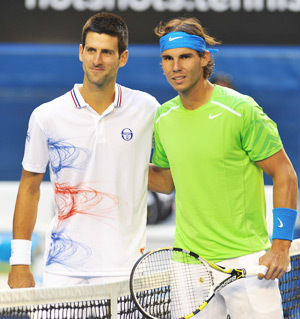 Djokovic said of Nadal's late match surge, "I had lots of chances to finish the match in the fourth, but he came up with some incredible serves and incredible points." Indeed, virtually everyone who saw the match noted that the quality of play increased with the time spent on court. The first hour was good, but hours four and five, just wow. Djokovic and his rival produced an epic that ran so long on ESPN2 that it was still on live when the network was scheduled to beginning replaying the match at 9AM. You know, for the misguided fools who didn't think this match would be worth the virtual jet lag in engendered. In fact, it was the longest major final of the Open era. When all was served and returned, it would be Djokovic who would script the final change of momentum. After 5 hours and 53 minutes the scoreline read, 5-7, 6-4, 6-2, 6-7 (5) 7-5. Novak Djokovic had etched his name deeper into the history books claiming his fifth major title through an explosive see-saw battle on Rod Laver Arena. When a player has a year as phenomenal as Djokovic did in 2011, the only legitimate question is "Can he back it up?" Djokovic answered it emphatically, not by winning the match and the tournament, but by facing down the relentless charge of his battle-tested opponent, Rafael Nadal. What of the Spaniard, though? He who fought so valiantly but once again, after a career full of picking up winner's trophies seemingly, suddenly, shunted off to play second-banana to a world-beating Djokovic? As much as a loss can be considered a statement match, this one was. Nadal went down two sets to one and he kept coming. He went down a mini-break int he fourth set tiebreak that left him a couple swings of the racquet from being finished in the fourth set, and he kept coming. He blew a 4-2 lead in the fifth set, missing an easy backhand pass that would have given him two points for 5-2, but he kept coming. Nadal said of the match, "It's true I had big mistake with 30-15 [point]. But it's not moment to think about that. That's another just moment in an almost six hours match. Forget about that knowing that I really had real, very real chances to have the title and to win against a player who I lost six times last year. But I didn't. I never put him in this situation during 2011, all 2011, so that's another positive thing for me. I didn't have mental problems today against him. I had in 2011 all these mental problems. Today I didn't have." Nadal has always been considered a Babolat-brandishing pugilist, but the rise of Djokovic left many in the tennis gaberati wondering if the Djokovic challenge was going to put the Man from Mallorca down for the eight count. If we learned anything from Nadal, both on the court and in the press room tonight, it's that he sees the Djokovic challenge, he has the means to rise to it and he intends to do everything in his power to overcome it. All that, and that he very well may do it soon. 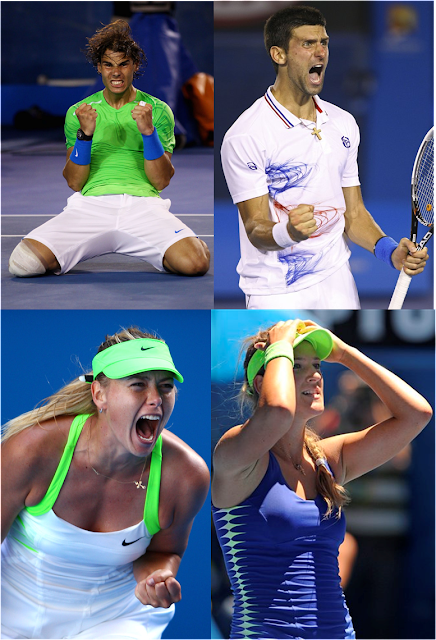 In fact, if you look at the four singles champions who graced Rod Laver Arena this weekend a common theme emerges. They each came into these matches with a question, and win or lose, they all answered it in the same fashion. Victoria Azarenka staked her claim to legitimacy as World No. 1 and one of the biggest prizes in tennis. Maria Sharapova shook off years wandering in the wilderness of the yips to reach her second major final in the last three events. Novak Djokovic quieted the questions about being a one year wonder, beginning 2012 right where the 2011 majors ended for him, in the winner's circle. While Rafael Nadal has shown no tendency to shrink from the challenge Djokovic poses to him and was within a few millimeters from doing so early this morning. Win or lose, each champion answered the call with a simple response: "I'll Be Back" We'll be watching. Superb writing here. Really sums things up correctly, without overdoing anything. 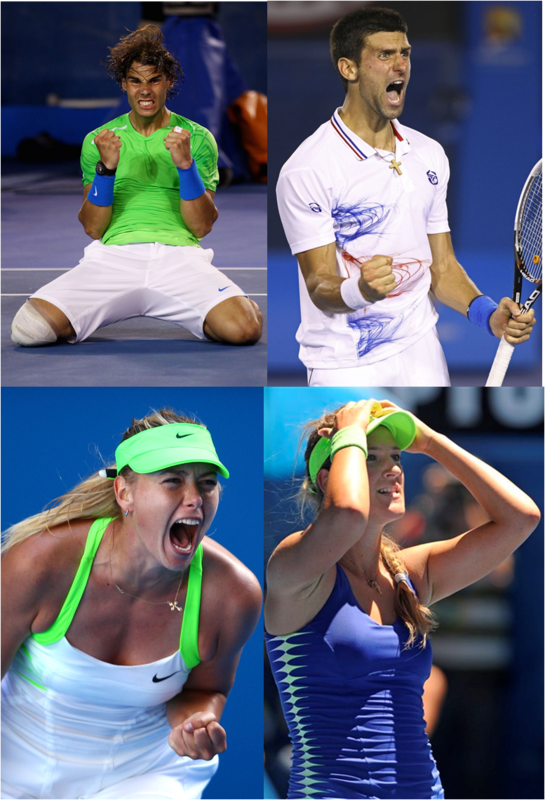 And with kudos to Rafa and Sharapova. I got wildly mad at Sue Barker yesterday when she said Djokovic would be favourite for Roland Garros. Your article and Rafa's own reaction rather sums up my own ideas. The true gem in this marvelous piece is your way of getting to the heart of a player's career and distilling the essence of each athlete's journey within the sport of tennis. There's a piercing, poignant quality to these insights, and it makes the analysis that much more accurate. I highly enjoyed reading this. The Azarenka and Nadal sections were especially impressive. However, he may have a more omega replica sale style, then you may want to choose something a bit different, and many of the modern tag heuer replica come in unique designs which he may appreciate. Caution should be used in that way. Nowadays watches with big rado replica uk are in style. From the boardroom to the wrists of celebrities, you can see them sporting these designer or rolex replica uk and true enough it looks good. In case your overstated sizes put on fit you, then put on force the trend giving you. Always consider where he is likely to wear the watch, whether that is at rado replica or when going out for the night, as this could play a role in whether he wants something new and alternative, or a more classic design.